What's this Hatt doing on my pulpit? Last month we anchored in SF Bay for a weekend of Blue Angels performances at the annual SF Fleet Week. Thurs and Fri shows were enjoyable and uneventful. Then there was the Saturday show! We were anchored near a 65 Hatteras during the airshow. The afternoon ebb was flowing with 10-15 kt winds in the opposite direction out of the WSW. We were anchored west of Alcatraz Island for protection from the current, but near the north end and experienced some occasional swings due to eddy currents and winds. For the most part, we were lying on a westerly heading into the wind with him located about 50 ft north of us. We were close enough to talk to each other about our proximity and made adjustments to rode so we were both pleased with the positioning. During the Blue Angels performance, my wife called me to the bow "right now". The Hatt had drifted west of our position and was now perpendicular to the wind and our alignment into the wind. We were tight on anchor as he drifted slowly into our anchor pulpit. The pulpit poked 2 holes into the masonite panel above his caprail and below his handrail. These holes can be seen in the photo below by the black arrow. Wave action while coupled forced my bow pulpit to pop vertically and pulled a couple lag bolts loose from the top of the pulpit. 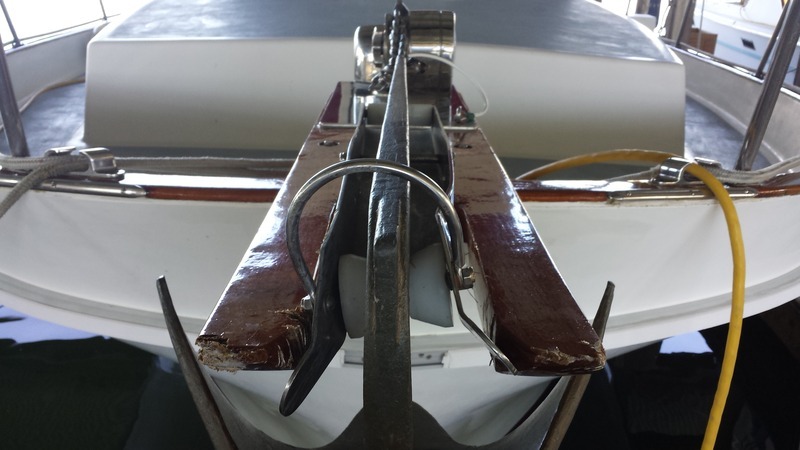 I was on the bow as they were closing in within a few feet of our bow, but I was unable and unwilling to place my hand in the boat's path to release the anchor rode from its cleat. 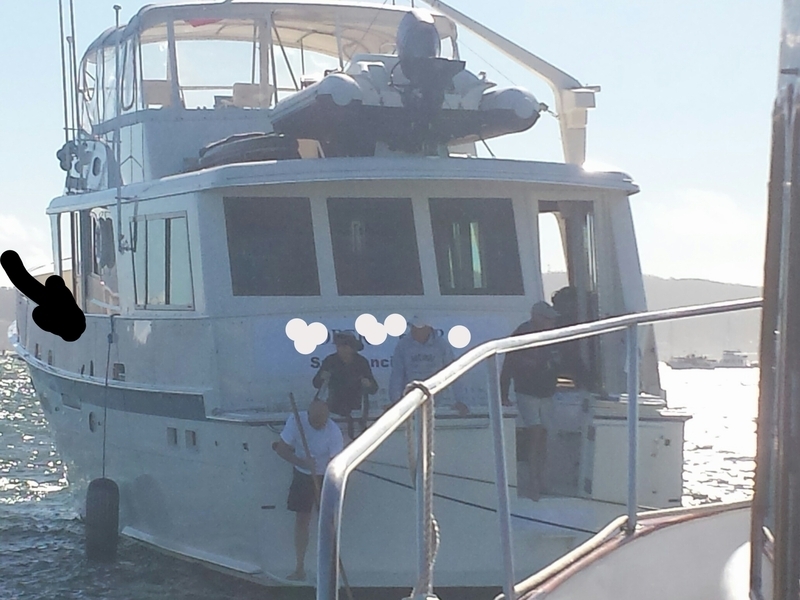 Once the boat's slide into us stopped, I was able to release the rode, start engines and back off from the Hatt. No further damage was incurred during the 'uncoupling'. 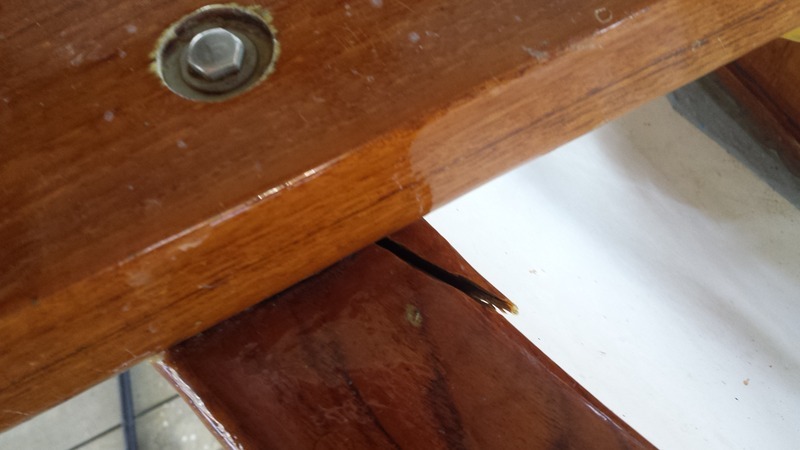 Pulpit, rub rail and anchor roller damage. 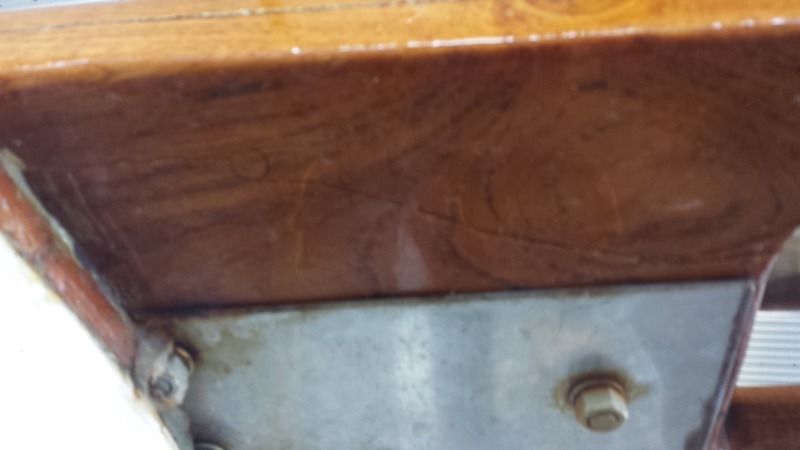 The bolts on top of the pulpit have pulled loose from the vertical loads. Fortunately, the other guy's insurance has stepped up to the plate and accepted liability. Now the repairs begin. 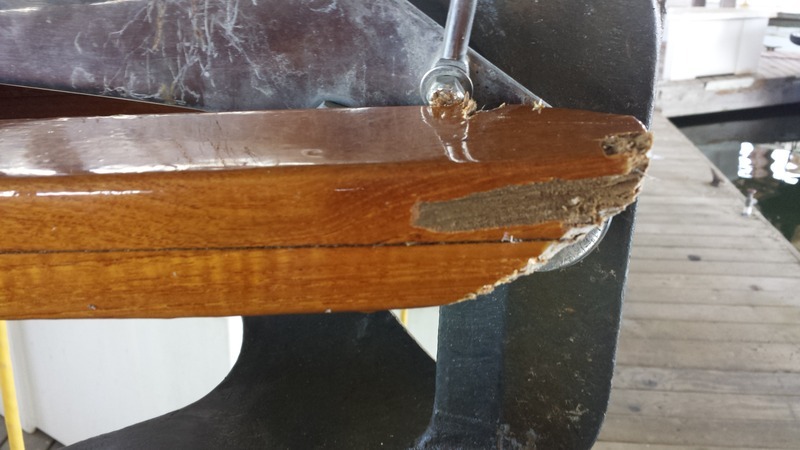 The yard wants to remove the bow rail and 30" of caprail from the pulpit to the first scarf to inspect for fiberglass damage. My first impression is to pull the windlass and pulpit first and have a gander underneath. Here's a couple pics of what it's supposed to look like. Note the 3 lag bolts across the top into the caprail and underlying fiberglass. The stbd and center ones appear to have popped a bit. 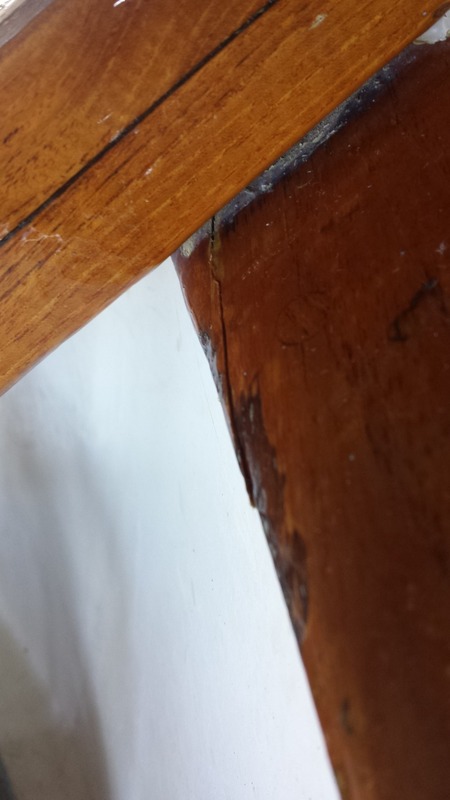 If the caprail is just superficially cracked and can be repaired and no damage is apparent or likely under the caprail, I'd rather not have it all removed, replaced and revarnished to match. It should be easy to fix a couple of stripped out lag bolts in a structure that has proven to be 'frangible' yet strong and reliable. I definitely need a new anchor roller and teak pulpit. Also the rubrail is missing a chunk from the bow after the encounter, so I'm expecting a new rubrail. I want it fixed right, but I'm not real anxious to be out of the water for any longer than necessary. 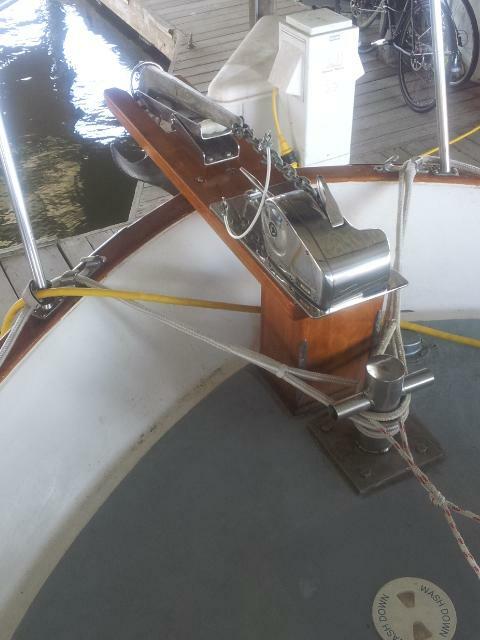 Since I engineered and installed the pulpit and windlass, I have a pretty good feel for its strengths and weaknesses. But sometimes when you're standing this close, you can't see the forest for the trees. What do you guys think? Am I crazy for not letting the yard and insurance company take it apart to see if it's damaged beyond a stripped lag bolt or two? I see your point. But I think I'd let them do what they want just to cover all the bases since you are not paying for it. I'd also counter sink the new lag bolts enought to bung and varnish over the top of them for a cleaner look. How did you figure out who is responsible? Because he drifted into you? Does it matter who anchored first or whether you were displaying the correct day shape? Since this is being handled responsibly by all parties, I don't want this to become a blame game. Suffice to say the evidence was never in dispute. I can't say enough about the handling of this by this guy's insurance company. I agree with Capt Bill. The fact they feel the need to dig deeper and the insurance company is ok with it indicates to me there's a possibility of hidden damage. Even if the risk in 10%, it's not one I'd want to take. This is the main reason I don't like bow pulpits. Supprised it dosn't happen more often .. maybe it does. I would let the insurance company evaluate it because at the end of the day you will be asked by the insurance company to sign off on the repair. If the insurance company does not do the evaluation they request and you sign off on the repair and later find that the repair was incomplete then that will be on your nickel. Just saying from a view several thousand miles away. Best of luck with the issue, I hope it goes well for you. If there was no insurance, I guess I could see doing a more minimal repair. Since it wasn't your fault, they are paying, and you're going to loose some boating time anyway, leave no stone unturned. Make it like new again and have no doubts about what you may have missed. Al: I Would let my insurance company know what happened since they have an interest in your boat. I would also qualify the yard that is going to do the work. A yard damaged our boat and our insurance paid and they would subrogate against the yards insurance company. Since the insurance company is willing to foot the bill I would let them do whatever exploratory work and repairs that they deem necessary. If you don't let them do it now it could become much harder to get them to pay if damage is found down the road. You must notify your insurance company and they will deal with the other company. At some point if you sell the boat the broker will require a written statement, at least mine did , of any crash damage. You will need to show proper and complete repair. Important point as you were in an allision and that is now part of the history of the boat so evidence that it was checked carefully for any other possible damage becomes valuable. It also protects you from a buyer coming back on you with some future problem. I agree with everybody. Let them do what the want to do. One of my previous Corvettes had a scratch on the front bumper cover. I wanted the absolute minimum done to fix it(minimal paint work). The body guy did exactly what I wished. He basically spot painted and "tried" to blend the clear coat(instead of his recommendation of painting the whole bumper cover). You cannot blend clear coat....it becomes cloudy around the edges. So in a certain light you see a smear where the repair was done. My point here is he "wanted" to do it right. I wanted what you are wanting....minimal repair. I got exactly what I asked for. And it wasn't the correct way to handle it!!!! John's post summarized the issue best. Years ago when I directly interacted with customers it was the ones "most involved" that where the least satisfied, the folks that educated themselves yet chose not to interfere with the process that came away the most satisfied. Basically let pros do what pros do is the best advice, if not DIY and get it over with. And if there isn't a bow pulpit, then what gets damaged? The bow? I look at the pulpit in this case like a battering ram he had set up in case anyone approached in a manner that would damage the boat. 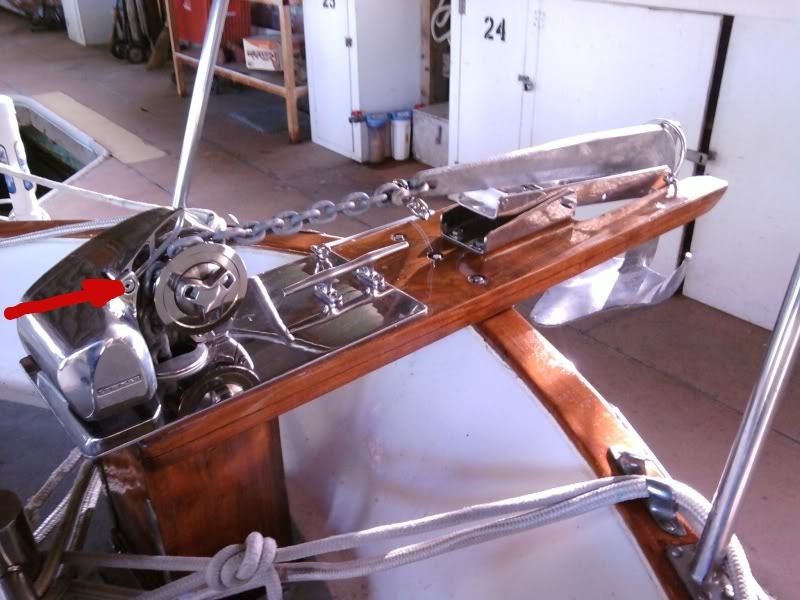 The bow should be able to handle harbor maneuvering bumps far better than some boards screwed to the cap rail or to a post that's lightly fastened to the deck. In the process of taking side loads a lot of twisting forces can/will do considerable damage to the cap rail or/and deck. It would be nice if they were built as a weak link and could take a side load w/o damaging the rest of the boat. But then one would build in a weakness that would give way in a storm while at anchor. Many boats that sail a lot take heavy side loads as well as vertical loads in demanding anchoring situations. I think the best bet is an anchor that rides w it's shank through a hole in the bow on CL right about deck level. Then light collisions to the bow would probably just be paint smudges. Thanks for all the advice here, guys. I'm glad I posted this for your counsel. Tomorrow is the haulout. Pics to follow. You hooked him well, if you could have landed him he was yours to keep. Yes, I have been in touch with my insurance company regularly throughout this phase. Now that his insurance company is stepping up to the plate, subrogation should not be necessary.